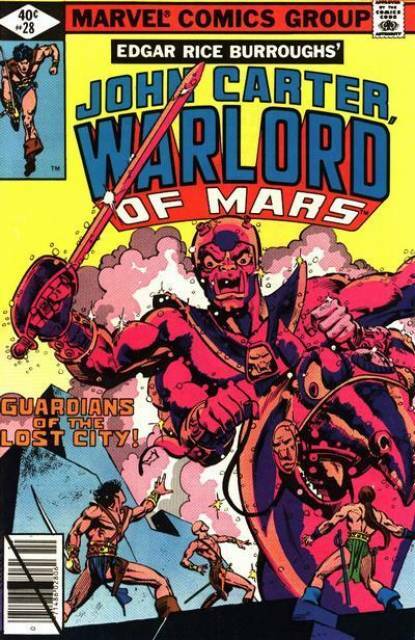 We reach the end of Marvel's original run on Barsoom as John Carter and company face "The Weapon-Makers of Mars!" On an atmosphere mapping mission with Kantos Kan and scientist Sasoom Thil, Carter and a squadron of Helium warriors head toward the ancient city of Aaanthor. Once there though they discover many strange sights, like giant bugs, frozen white apes and a disappearing horde of Green Men. Deciding to camp for the night, Kantos sneaks back in to investigate and when he disappears John leads a rescue mission and discovers the truth about the city, a truth that might hold the key to Barsoom's past and future. 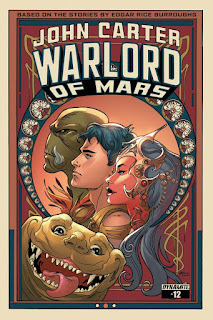 Written by Marvel writer Peter Gillis, "The Weapon-Makers of Mars!" is an intriguing finale for the series that works in the best of Edgar Rice Burroughs-unexplored cities with hidden secrets, references to such races like the Therns and rousing action. Gillis also weaves a suspenseful tale filled with quite a few twists and turns. I won't spoil many here except to say for fans this is a rousing tale. Handling art duties for the final time is Richard Villamonte with help from Larry Hama and both deliver an excellent, pleasing look for the characters and the backgrounds. In fact this might be the most colorful and vivid the series has looked since the early issues. Plus how can go you go wrong with a giant Green Man? With this issue our look back at the 1970s John Carter, Warlord of Mars comes to a close...or does it? Stay tuned.